The Nike Sportswear Swoosh Crop Tank is imported. 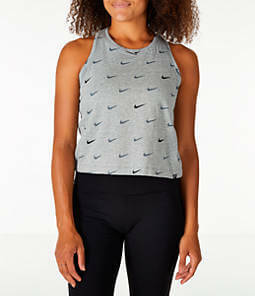 Sporty yet chic, the Women’s Nike Sportswear Swoosh Crop Tank seamlessly transitions from light workouts to everyday. Featuring a flattering, feminine fit and allover branding, this tank looks just as great on its own as it does layered with your favorite jackets and hoodies.